I’m currently working on a client’s project on migrating an important management application initially developed in VB6 to C# by using decompilation since the client lost his source code. This is my first .Net related post. The application uses many external components, including the powerful Crystal Report component. While I was working on this new version I faced a problem with the .Net implementation of Crystal Report. Actually, with Visual Basic 6.0 it was an easy task to add one or many sort fields to a report document in order to sort the result by field (for example by “Lastname”, “Firstname”, “Id”, or other). 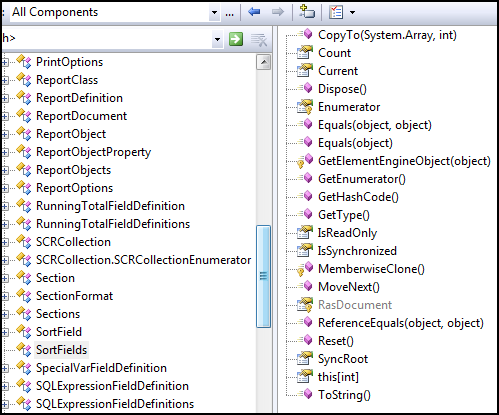 It’s not the case with .Net implementation of Crystal Report Document, on which you cannot dynamically add sort field to your report. You must add the sort field when you’re editing your report template. It’s not really convenient when you don’t know how many fields must be sorted when creating the document. The reason of this missing is not really clear since it’s an existing feature on Visual Basic 6.0. We will learn here how to add many SortField to the ReportDocument of a CrystalReportViewer, using reflection. Actually, it’s possible to add a new sort field using the mother inherited class of each used component. It return an object of type CrystalDecisions.ReportAppServer.DataDefModel.SortsClass. The description of that method show that it accept one parameter of type CrystalDecisions.ReportAppServer.DataDefModel.ISCRSort. ISCRSort is an interface, so we have to create a new instance of a class that implement the ISCRSort interface. That class is called “SortClass” and come from the “CrystalDecisions.ReportAppServer.DataDefModel” assembly. Our “rasSort” object now instantiate the SortClass class, implementing ISCRSort. Once the SortClass object is created, we must complete it with valid field, else it will return an error on execution. The SortClass class uses the “RasField” accessor to define the field which will be sorted.